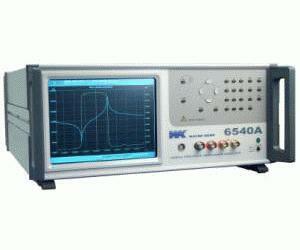 The 6500 series of Precision Impedance Analyzers provide precise and fast testing of components at frequencies up to 120 MHz. Basic measurement accuracy is ±0.05% making the instruments the best in the class. The accuracy and versatility makes the precision analyzers the ideal choice for many different tasks and applications including passive component design, dielectric material characterisation and manufacturing test. Engineers need to evaluate component characteristics at high frequencies with high levels of accuracy. The 6540A 120 MHz Precision Impedance Analyzer is therefore ideal for many demanding tasks, combining accuracy and ease of use at an affordable price. If a frequency range up to 120 MHz is not required then the 6530A or 6520A analyzers are available.